Long-running sitcom Last of the Summer Wine is to remain on the air, the BBC has said - contradicting claims made by its producer suggesting it was to end. Producer Alan JW Bell was quoted in the Huddersfield Daily Examiner this week saying he had been told another series of the show would not be made. According to the BBC, though, it "has not been decommissioned". "There is a Christmas special about to go out, followed by a new series in the autumn," said a spokeswoman. "The series after that will be commissioned once the new series is on air." The news follows the recent death of actress Kathy Staff, who played battleaxe Nora Batty in 243 episodes of the Yorkshire-based comedy. Brian Wilde, who played pompous ex-army corporal Walter "Foggy" Dewhurst in the show, died in March at the age of 80. "Millions still enjoy the series and the actors love being involved," Bell was quoted as saying by the Huddersfield paper. "Russ Abbott has just joined us and would have become the main character. When I broke the news to him he said: 'I'm gutted'." 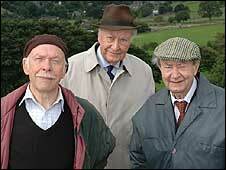 Filmed in and around the Yorkshire town of Holmfirth, Last of the Summer Wine made its debut on the BBC in 1973. Bell has been involved with the show since 1981, receiving Bafta nominations on its behalf in 1983 and 1986.